Super Size Me is one man's journey into the world of weight gain, health problems and fast food. It's an examination of the American way of life and how we are eating ourselves to death. Filmmaker Morgan Spurlock hit the road and interviewed experts in 20 US cities. From surgeons general to gym teachers, cooks to kids, lawmakers to legislators, these authorities shared their research, opinions and "gut feelings" of our ever-expanding girth. Finally, Spurlock embarked on a unique experiment in which he personally documents the effects of a fast food diet...on himself. 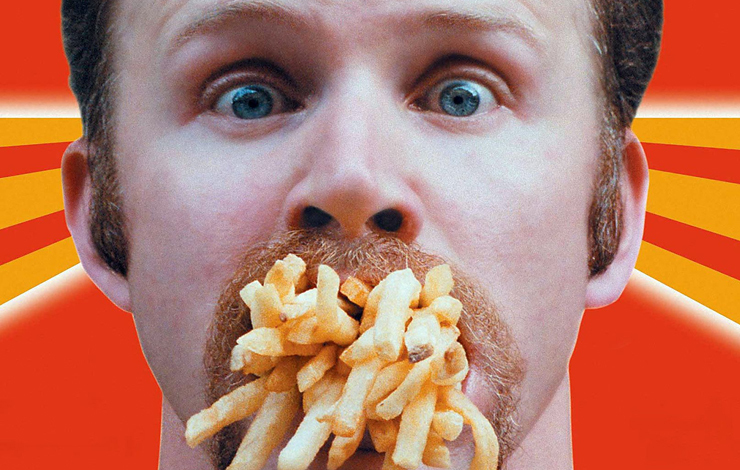 Super Size Me is the eighth highest-grossing documentary of all time, according to BoxOfficeMojo.com, at $11,536,243. The film was nominated for an Academy Award for Best Documentary Feature, and Spurlock won the Documentary Directing Award at the 2004 Sundance Film Festival, and the Writers Guild of America Documentary Screenwriting Award. Don't Look Back is about the 1960s and the man who got a lot of us through them. Bob Dylan is more than the folk singer touted by the record industry, more than the song writer whose poetry is the only kind many of us remember, more than the Kerouac-kid who haunts our best writing. He is the force that blew us out of one era and into another. His words are ambiguous, his style constantly changing and his avoidance of publicity obsessive, yet he remains the influential voice of our times. Don't Look Back was filmed during a three-week concert tour of England in the Spring of 1965. More than a view of an extraordinary concert tour, Don't Look Back is an intimate portrait of one of the most influential songwriters of our times. Don't Look Back was re-released on DVD through Docurama in February 2007 as a two-disk digitally re-mastered edition, with a new documentary by Pennebaker called Bob Dylan 65 Revisited, created from 20 hours of previously unused footage from that fateful tour. A landmark American documentary, Salesman captures in vivid detail the bygone era of the door-to-door salesman. While laboring to sell a gold-embossed version of the Good Book, Paul Brennan and his colleagues target the beleaguered massesthen face the demands of quotas and the frustrations of life on the road. Following Brennan on his daily rounds, the Maysles discover a real-life Willy Loman, walking the line from hype to despair. Source of synopsis: The Criterion Collection. Salesman was selected for preservation in the Film Registry of the Library of Congress. Koyaanisqatsi, Godfrey Reggio's debut as a film director and producer, is the first film of his "Qatsi" trilogy. The title is a Hopi Indian word meaning "life out of balance." Created between 1975 and 1982, the film is an apocalyptic vision of the collision of two different worlds--urban life and technology versus the environment. According to an entry in Wikipedia, Koyaanisqatsi took about six years to make--three years to shoot the film, and another three years for Philip Glass and Reggio to compose and edit the film in collaboration. ''You should use the camera as a way to meet women...." What begins as an attempt to retrace the path taken by General Sherman and his Union soldiers in their devastating sweep through the secessionist South becomes, in the words of Ross McElwee's sister, a brokenhearted filmmaker's clumsy chivalrous quest to find love. In his most celebrated film, McElwee points up the paradox of the inquisitive documentarian: "He's gotten scalded by life, his lover left him, and so he retreats into the mollusk shell of his camera and pokes his head out now and then." Meet Big and Little Edie Beale--high-society dropouts, mother and daughter, reclusive cousins of Jackie Kennedy Onassis--thriving together amid the decay and disorder of their ramshackle East Hampton mansion. An impossibly intimate portrait and an eerie echo of the Kennedy Camelot, Grey Gardens quickly became a cult classic and established Little Edie as a fashion icon and philosopher queen. Thirty years later, Albert Maysles revisited the landmark documentary with a sequel of sorts, The Beales of Grey Gardens, culled from hours of never-before-seen footage recently found in the filmmakers' vaults. Grey Gardens might be the first documentary to have inspired both a Broadway musical and a feature film. The musical, which ran for nearly a year, garnered three Tony Awards, while a feature film, starring Jessica Lange and Drew Barrymore as the Beales, is in the works for HBO. The Friedmans seem at first to be a typical family. Arnold Friedman is an award-winning schoolteacher; his wife, Elaine, a homemaker. Together, they raise their three boys in the affluent Long Island town of Great Neck. One Thanksgiving, the police raid their home, and Arnold and his 18-year-old son Jesse are both arrested. As a convoluted investigation unfolds, father and son are indicted for hundreds of shocking crimes. While the family vehemently declares its innocence, the Great Neck community is in an uproar, and the Friedmans are the target of their rage. The film follows the story--from the public's perspective and, most remarkably, through unique footage of the family in crisis. As the police pursue the investigation and the community reacts, the fabric of the family begins to disintegrate, revealing disturbing questions about justice, community, family and, ultimately, truth. Capturing the Friedmans won the Grand Jury Prize for Best Documentary at the 2003 Sundance Film Festival, was named Best Documentary by 12 film critics associations, and earned an Academy Award nomination. The most stigmatized people in Calcutta's red light district are not the prostitutes, but their children. In the face of abject poverty, abuse and despair, these kids have little possibility of escaping their mother's fate or for creating another type of life. In Born into Brothels, directors Zana Briski and Ross Kauffman chronicle the amazing transformation of the children they come to know in the red light district. Briski, a professional photographer, gives them lessons and cameras, igniting latent sparks of artistic genius. The children's photographs are not merely examples of remarkable observation and talent; they reflect something much larger, morally encouraging and even politically volatile: art as an immensely liberating and empowering force. Born into Brothels earned a number of awards, including an IDA Award, an Academy Award and an Emmy Award. Titicut Follies was banned from release (outside the field of education) in the US from 1967 to 1992 by a Massachusetts Supreme Judicial Court ruling that, since it was filmed in a hospital, the film violated the patients' rights to privacy. Wiseman, however, had received permission from all of the people portrayed in the film or else their legal guardian--the superintendent of Bridgewater, in this case. Wiseman believes that the Massachusetts government, feeling concerned that Titicut Follies portrayed a state institution in a bad light, took the film out of circulation to protect its own reputation. In 1992, the film was allowed to be shown on PBS, and is now legally available through Zipporah Films, Inc.
Cuba is a land of sensuality, passion, determination and pride. It is also a land filled with stunningly dramatic music created by some of the world's greatest--and least recognized--musicians. Buena Vista Social Club follows many of these the musicians into the hot, dusty streets of their youth, where their recollections lead to touching--and often humorous--stories, which in turn serve as fuel for some of the most remarkable and heartfelt musical performances ever captured on screen. Buena Vista Social Club also covers the amazing musical and spiritual journey of these unforgettable souls--from downtrodden, poor barrios to a celebrated venue in Amsterdam to the center stage of New York's illustrious Carnegie Hall. Following the worldwide success of the 1997 CD Buena Vista Social Club, produced by Ry Cooder, Wim Wenders was inspired to follow Cooder, who had composed music for many of Wenders' films, to Cuba to document the stories and artistry of the musicians there. Fahrenheit 9/11 is Michael Moore's searing examination of the Bush Administration's actions in the wake of the tragic events of 9/11. With his characteristic humor and dogged commitment to uncovering the facts, Moore looks at how--and why--President George W. Bush and his inner circle avoided pursuing the Saudi Arabian connection to 9/11, and shows us a nation kept in constant fear by FBI alerts and which was lulled into accepting a piece of legislation, the USA Patriot Act, that infringes on basic civil rights. Fahrenheit 9/11 also takes us inside the Iraq war to tell the stories we haven't heard, illustrating the awful human cost to US soldiers and their families. Fahrenheit 9/11 was the first documentary to win the Palme d'Or at the Cannes Film Festival since 1956. Moore's film went on to become the highest grossing documentary of all time, earning over $119 million in North America alone. With Winged Migration, filmmaker Jacques Perrin takes on his greatest challenge yet: exploring the mystery of birds in flight. Five crews of more than 450 people, including 17 pilots and 14 cinematographers, were necessary to follow a variety of bird migrations through 40 countries and all seven continents. The film covers landscapes that range from the Eiffel Tower and Monument Valley to the remote reaches of the Arctic and the Amazon. All manner of man-made machines were employed, including planes, gliders, helicopters and balloons. And numerous innovative techniques and ingeniously designed cameras were utilized to allow the filmmakers to fly alongside, above, below and in front of their subjects. Winged Migration, which was nominated for an Academy Award, is number seven on the list of top-grossing docs of all time, at $11,689,053. Timothy Treadwell's death was as sensational as his life: Having presumed he could live safely among the grizzly bears of the Alaskan wilderness, the outdoorsman and author--along with his partner, Amie Huguenard--was eventually killed and devoured by one of the very animals to whom he had devoted years of study. In telling this story, Werner Herzog relies considerably on Treadwell's own video footage, shot during his time in the wild. But the famed German director takes Treadwell's story into unexpected emotional frontiers and startling landscapes of the mind. Where he doesn't go is equally as fascinating, but if Herzog is consistent about anything, it is the defiance of the ordinary, the rejection of the obvious, and the relentlessly searching eye he turns on whatever subject attracts his attention. Timothy Treadwell was also in IDA's Fiscal Sponsorship Program at the time of his death. Ten years after the liberation of the Nazi concentration camps, filmmaker Alain Resnais documented the abandoned grounds of Auschwitz. One of the first cinematic reflections on the horrors of the Holocaust, Night and Fog (Nuit et Brouillard) contrasts the stillness of the abandoned camps' quiet, empty buildings with haunting wartime footage. With Night and Fog, Resnais investigates the cyclical nature of man's violence toward man and presents the unsettling suggestion that such horrors could come again. "The effective war film is often the one in which the action begins after the war, when there is nothing but ruins and desolation everywhere: Rossellini's GermanyYearZero (1947) and, above all, Alain Resnais' Nuitetbrouillard, the greatest film ever made." The three-day Woodstock music festival in 1969 was the pivotal event of the 1960s peace movement, and this landmark concert documentary is the definitive record of that milestone of rock 'n' roll history. It's more than a chronicle of the hippie movement, however; this is a film of genuine historical and social importance, capturing the spirit of America in transition, when the Vietnam War was at its peak and anti-war protest was fully expressed through the liberating music of the time. With a brilliant crew at his disposal (including a young editor named Martin Scorsese), director Michael Wadleigh worked with over 300 hours of footage to create his original 225-minute director's cut, which was cut by 40 minutes for the film's release in 1970. Eight previously edited segments were restored in 1994, and the original director's cut of Woodstock is now the version most commonly available on videotape and DVD. The film won the Academy Award for Best Documentary, and earned a nomination for Best Editing. Woodstock was reportedly edited from 120 miles of footage shot at the three-day concert.